For girls, Grades 1st-5th. Enjoy a time of crafts, music, and lessons! Meets weekly throughout the school year. For boys, Grades 1st-5th. Learn woodworking, tying knots, fishing, and more! Meets weekly throughout the school year. 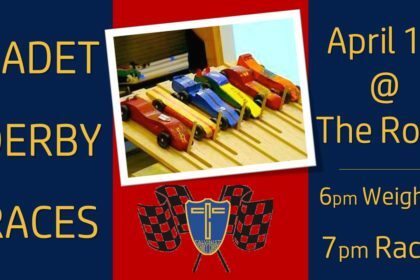 Join the fun and cheer on the Cadet boys at their annual Pinewood Derby Race!